Top 10 Cabin Rentals in Townsend TN offer easy access to Great Smoky Mountains National Park along with peace and quiet. A Smoky Mountain Getaway is a getaway to remember! This 2 bedroom cabin rental sleeps up to 6 guests in a spacious cabin rental nestled in a lush forest setting. 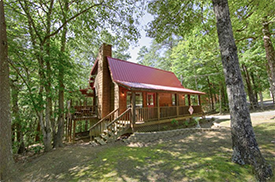 Alpine Retreat cabin offers several great outdoor features: a year-round family size hot tub on the covered deck, a picnic table and gas grill for a family cookout, a porch swing, and plenty of outdoor seating under the forest canopy.